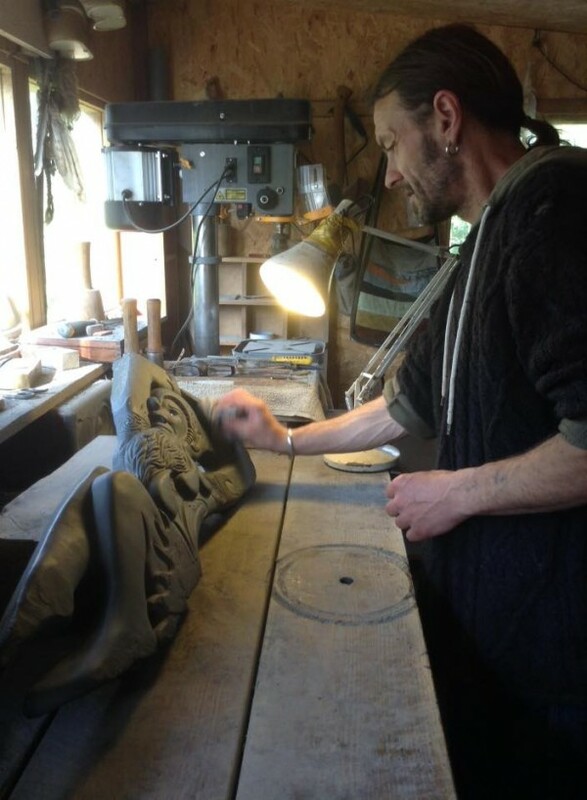 Jon Evans is a sculptor, illustrator and poet inspired by nature, mythology, Celtic art and the inner world. He works from his home and studio, a Gothic Victorian school building which he converted and lives in with his partner Jen and children Minnie and Bess, near Aberystwyth in Mid Wales. Born in Carmarthen, South Wales in 1969 Jon had an unsettled childhood of children's homes and foster care, and then lived on the road as a New Age Traveller before settling in Mid Wales to raise children Liam and Liana. A self taught artist, Jon first developed his drawing skills doodling intricate illustrations on any scrap of paper to hand. Upon being given an A2 sized pad of paper as a gift, intricate mythological and spiritual drawings started to fill the pages. When asked if he was creating a book, Jon went back to the start and wrote about each picture in poetic form. Seven years later the book was completed and he put down the pens and picked up a chisel and began to carve wood and then slate sculptures. Jon appeared on Channel 4 TV creating a 'dragon wall' in a Welsh garden on the Landscape Man series in 2010 and a selection of his wood carvings appeared on set in series 2 of S4C/BBC's Hinterland crime noire drama series, set in the Aberystwyth area, in 2015. We hope you'll enjoy looking at Jon's hand carved welsh slate and wood sculptures on this website. The book is under wraps whilst a publisher is sought, but watch this space or follow Jon Evans Artist on Facebook for updates. Visitors to his studio and gallery are welcome any time by appointment or on the Ceredigion Art Trail every summer. I first became aware of the slate and wood carvings, and the drawings of Jon Evans, at The Festival In The Shire, (A J.R.R. Tolkien related event) in Mid Wales. From the outset, I could see that here was a dedicated craftsman, completely focused on his art, and versatile in his application. His exhibition held a number of innovative carvings in a celtic style, but what really took my eye was his natural wood 'sculptures', made from driftwood and tree roots from a time-worn oak. Even the selections of these raw materials indicated a discerning eye. Jon is in my opinion one of the best sculptors preserving the traditions of Celtic carving in slate, stone and wood alive today.